Professional Automatic Electric Business Card Slitter; model 1204, series MC. Model 1204 accommodates 8.5” x 11” stock and cuts 12 business cards in 2 passes. Cut 8.5” x 11” sheets into three strips of 3.5” x 8.5 “ on the first pass and finished the job by taking the 4 up sheets and cutting them down to 2” x 3.5” cards. 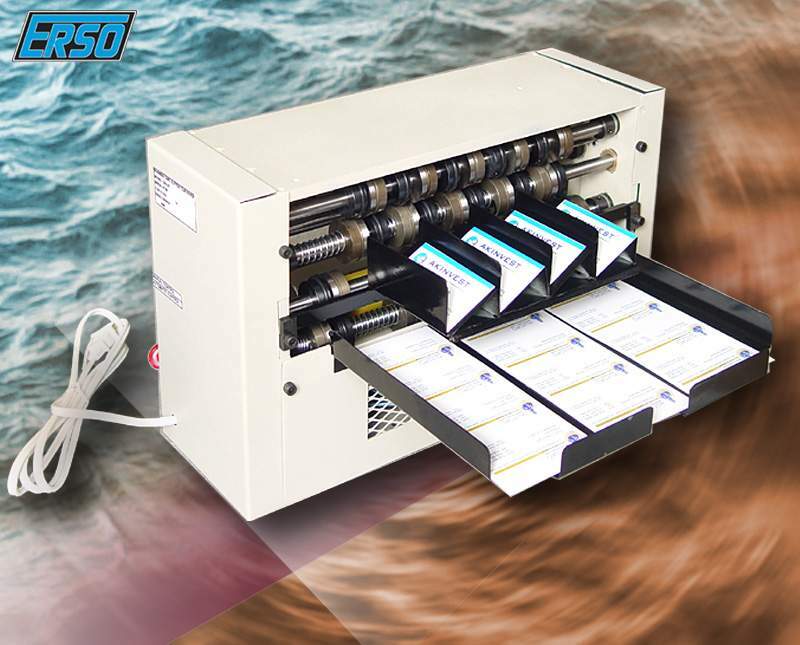 Infeed stack allows keeping up to 50 pages #150 and cut with speed up to 350! Business Card per minute. 3) Updated ( significantly ),reliable Urethane bottom friction feed , which catch any types of paper. 6) Easy cut glossy paper 10-14 pt. 9) Finished product accurately stacks into special boxes. 11) Powerful motor 1/10HP .